Blog BIG Bubbles, GIANT Bubbles! My thanks to everyone who participated in the contest on Facebook. To my knowledge, this has been the first world-wide contest in giant bubbling ever to be attempted. There were 55 contestants from 23 countries: Argentina, Austria, Belgium, Brazil, Canada, England, Finland, France, Germany, Guadalupe, Hungary, Israel, Italy, Latvia, Malaysia, Mexico, New Zealand, Philippines, Portugal, Russia, Scotland, Spain, Switzerland, and the United States. They entered 234 photos. We crowd-sourced the first phase of the judging, and the photos received 2,098 Likes, and 296 comments. In the BIG Category, many impressive bubbles could not be measured because they were incompletely shown, or lacked a usable scale figure. Other huge bubbles were incompletely formed. (See Method of Comparing BIG Bubbles about our judging of the Category.) In the end we chose “free-floating” bubbles only. We judged their relative sizes by comparing the “Big Bird” bubble of Alan McKay, and this finally resulted in a three-way tie. The Grand Prize goes to Alan McKay, who pioneered the two-pole giant bubble apparatus we use today, and whose big, strange, beautiful Guinness Record 114-foot-long bubble of 1995 remains unsurpassed. Alan McKay is World Bubble Champion. The winning photos (marked as such) are now at the top of the album. Alongside them I’ve placed several other photos from each winner, to give a wider idea of their work. I started this contest on a lark, it has been flawed in many ways, and I apologize for my errors. However, I think the contest might well prove valuable. I see it now as a rough sketch, a trial run for better contests that might occur in the future. 1. It gathered a fine collection of photos that showcase the giant bubble sport world-wide; 2. It developed a simple graphic method for comparing sizes of giant bubbles, and 3. It proved many “free-floating” bubbles far larger than those of Guinness. 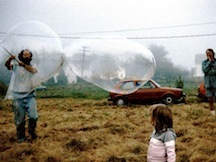 Anticipating criticism, I’d like to share my credentials (which, aside from giant bubbles, are humble enough)--- I invented the Bubble Thing in 1984; developed the first mixes and techniques; set the first Guinness giant bubble record in 1986 (with a 50-footer); and over the years have marketed 4,000,000 Bubble Things world-wide, where they inspired Alan McKay and other pioneers, most of them old folks now. When I claim, citing my patents, to have invented the giant bubble sport, there are few to deny it. I’ve wondered sometimes whether competition in a playful activity like ours is a good idea or a bad one. Whatever the answer, competition exists, and for many of us it’s a spur to bigger and better things. Here’s to an enormous bubble future! Until now in the contest, I’ve not posted my own Likes. But some of your photos I absolutely love, so now I’ll be going through to Like and comment on my favorites. I've started sending out individual letters of congratulation. This will take a few days. Again, thank you all for being in the contest, and best of luck to everyone!